A porta potty refers to various types of portable toilets or bathrooms. Often in the United States, porta potty refers to small toilets that can be used by kids while they’re being potty trained. Also, porta potty may refer to portable public bathrooms you’re likely to see at construction sites, outdoor events, and anywhere else where it would be impractical or inconvenient to construct a bathroom. When you are at an outdoor concert or in the middle of bathroom remodeling, those porta potties which can be rented are your best friend. Also known as port-o-lets, tidy johns and porta johns, you can see them everywhere from the presidential inauguration venue to the Grand Canyon. In fact, the largest gathering of porta potties was at the inauguration day of Barack Obama in 2009, with more than 5,000 porta potties on hand. In 1940s, the shipyards of Long Beach realized that workers were losing valuable work time because they need to walk all the way back to the docks just to use the bathrooms. For this reason, they decided to build temporary bathrooms on the ships, making their work go faster and workers a little happier. They constructed a wooden cabana and then placed a small holding tank, and the first portable toilet was born. During the 1950s and 1960s, event organizers and construction workers suddenly realized the benefits of portable bathrooms. A number of companies took this idea and built their own version. Biff and Job Johnny became two prominent manufacturers of porta potty. 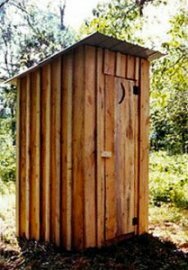 The earliest porta potty was made from wood and metal. It was huge, heavy, and smelly, but remain far superior to having no bathroom at all. In 1970s, fiberglass portable restrooms began replacing metal and wood ones. Fiberglass was lighter and easier to clean as compared to metal and wood versions. By the 1980s, plastic began replacing fiberglass as the preferred building material. Plastic is the lightest material and the easiest to construct and clean among other materials. Polyurethane is the most common plastic material used to build today’s portable restrooms. Also, companies have formulated chemicals to aid in biodegrading human waste and making the restrooms smell better. Companies that provide porta potties to job sites and events typically deliver portable restrooms to the site, maintain the cleanliness of the toilets and then remove them after the event. In the 1980s, Gotugo entered the porta potty business, offering clients fast and efficient service and providing clean porta potty rental units for construction sites as well as major and minor events such as big concerts and weddings, respectively. Competitively priced, Gotugo has become a leading company that offers modern and clean porta potties in many states. In the U.S., portable restrooms save more than 125 million gallons of fresh water daily, water that can be used for cooking, bathing, drinking and other daily activities. This makes porta potties an environment-friendly way to manage job sites and events. The portable restroom industry is not always on the forefront of the people’s minds, but this unique and essential business allows people to enjoy places, events and experiences that would be uncomfortable without them. Thus, the next time you are enjoying an outdoor concert, or special events such as the inauguration of the new U.S president, remember how shipbuilders in Long Beach contributed to a more convenient and comfortable way to make it happen. However, a porta potty isn’t always a great place to be. Often, instead of having flushing capability, the bottom of the toilet or the container where the waste is deposited is covered with chemicals that gradually degrade human waste. Many people also find this kind of restroom short on cleanliness because most don’t have water and sink. Waterless handwash which is available in dispensers has been an advantage to the porta potty industry, as people can at least sanitize their hands after they use the bathroom.